Our favourite easy dress in a light grey horizontal ribbed knit. 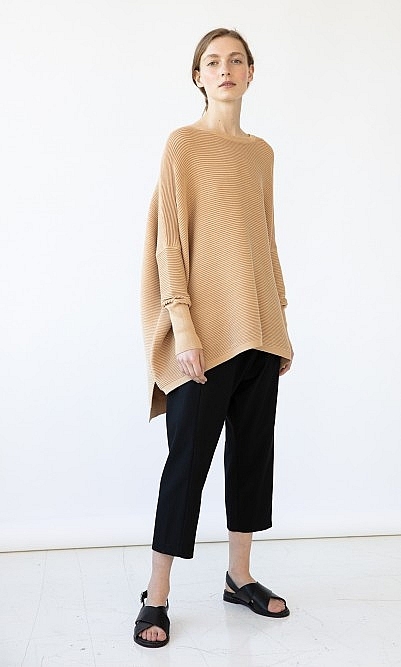 The oversized cut and dipped hem are offset with narrow sleeves and deep flattering cuffs. PlümoStudio. L95-100cm. Fabric and care: 80% Viscose 20% Lycra. Cold wash. This is the third one I have purchased - can one say more? But I'm going to. It is the most versatile dress that I have ever owned, dress it up or down, layer it with a bright roll-neck underneath and it is says Christmas. It is a perfect backdrop for the most alternative kind of necklace. I'm a tall skinny seventy plus and it makes me feel a great deal younger without looking as if I'm trying too hard to be cool.